There is a truism in river fly fishing that 90% of the fish are caught by only 10% of the anglers. The reason for this often observable fact is simple. Many fly fishers lack the knowledge or techniques required to catch more than 1 or 2 fish. The best and fastest way to understand these techniques is with an experienced river guide. I have over 20 years of fly fishing experience Worldwide (Canada, USA, Himalayas, Europe) and am a former English Rivers National Fly Fishing Champion. 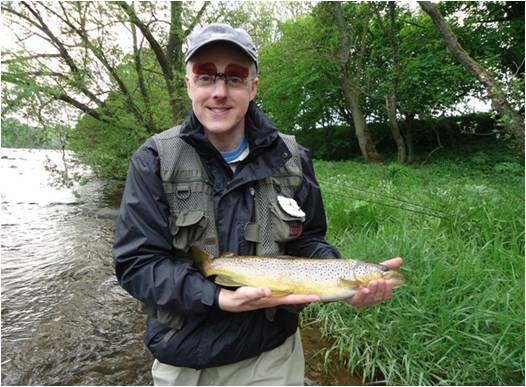 I am passionate about river fly fishing and want my clients to enjoy their experience. To this end I tailor guiding to fit you. I guide on the river Tees, the upper reaches and on the Darlington Anglers Club water. I also guide on the Derwent a beautiful trout stream near Newcastle. I can provide almost all equipment within reason. Fred Bainbridge. Multiple England Fly Fishing International. ''I'm fortunate enough to have fished in many wonderful places and alongside some truly great anglers including former World Champions and the like. It's safe to say I’ve experienced some cracking angling days along the way. 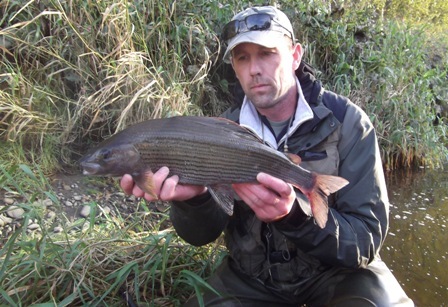 My days grayling fishing guided by yourself has topped the lot Jon! You promised me fish of a life time here in the UK and you delivered. I've caught previously what I considered to be a large fish at 2lb 8oz but you guided straight to two personal bests in excess of the magic 3lb and the chance of even bigger in just one day. Can't say much more than thank you Jon !" I really enjoyed yesterday you did a fab job thank you so much. The conditions were tough but you found fish and showed me how to set the rod up right, & where and what to do; your knowledge is fantastic and am very impressed with the service I got. Winter grayling fishing sound good to me!! will let you know about the membership. have just sorted all the nice flies you gave me and the long nymphing leaders thanks for them as well!! Many thanks for a splendid day yesterday - excellent call on which day to go, loads of expert knowledge passed on, some lovely fish and great surroundings. I reckon that if I'd landed the big one (the last time we mention it!) I'd have run out of superlatives! Will be back one day - the duo on the Derwent by day ticket is the next plan. Hi Jon, Just a quick note to say thanks very much for the session on the River Derwent, last Friday. So only got to speed up my reaction time to get more hook ups so that's not too bad. Can't wait to get out on the Coquet and practice the techniques you showed us. Thanks again for all your help and the flies. Thank you for a fantastic days fishing on Tuesday. Perfect conditions and 10 good fish! You have a lovely stretch of water Snow Hall. I shall practice your nymphing technique and let you know how I get on. 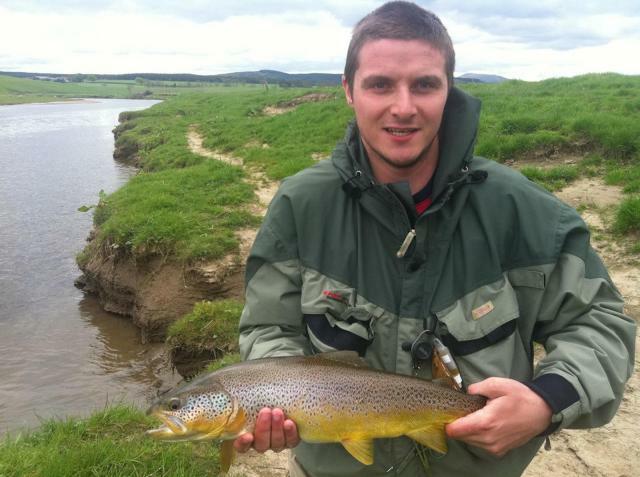 I just wanted to thank you once again for a fantastic day's fishing on the Tees yesterday - I loved every minute of it! You demonstrated all the techniques I asked you to cover, and took me to all the "fishy" spots of the stream which suited the various methods. Hopefully I can put into practice what I learned over the next year. I'll no doubt be in touch soon for some more flies. Until then, best wishes and many thanks. Finally Cheryl and I would just like to say we had the most brilliant time, we thoroughly enjoyed your company and we look forward to seeing you both again. And for my part Jon thanks a million for your superb tuition and guidance. Cheers. Just wanted to say thanks again for the session last night – it was great fun, and will really set me up to go and start getting some practice on the river myself! Cheers. If you would like to book a guided tour or put an enquiry or leave your testimonial please click here or go to Contact Us page. We look forward to hearing from you. Many river fly patterns catch more fisherman than fish. I have spent years developing flies that work 90% of the time in 90% of places. To present these flies correctly it is imperative the fly fisher uses the correct leaders. Below are comments from satisfied onstream-guide customers. They are working a treat !! Just wanted to drop a line of feedback. As you say in your films, furled leaders your production are way ahead competition when it comes to perfect presentation in many aspects. Your advices about tying pale watery dun with soft partridge hackle were priceless! They were absolute killers on Avon near Salisbury, and Itchen in Shawford. I'll be recommending your web site to friends! Hi, My girlfriend purchased some of your polyphaetis and black magic nymphs for me two weeks ago. I used them on the river Wylye as I live in Wiltshire. I caught seven trout, four grayling and salmon parr. The biggest fish was a 1 3/4 pound grayling, not bad for my first ever grayling or fly fishing and Czech nymphing session (amazing I'm now hooked so to speak). I will be buying some more flies and products from you. Hi there Jon. Can't say how much I'm enjoying my French nymphing and wish I'd got into it years ago. It was all down to your little video that got me inspired to give it a go! Many thanks for your excellent videos that I recently discovered on you tube. They have been very interesting, informative, and well produced - so about the best I've seen online! Thanks for the info and I will get back to you you about a day. Have received the flies and thanks for the freebie! Only had 4 fish over three evening sessions on the Frome, lovely spot but overfished, 3 other rods blanked. Caught all 4 on your olives - thanks!! Thank you for you excellent onstream-guide.com. As someone relatively new to fly fishing and very much still learning the ropes, I have found it to be the best on-line tutorial available. Your advice is given very clearly and generously. I have just ordered a furled leader and one or two flies from you. Thank again. Tried out the polyphaetis today on the R. Dove that I bought from onstream. Excellent results with some big grayling and a number of nice trout. The Hot Spot also performed. Many thanks for introducing me to the new flies which will have a permanent place in my box. I've ordered the dancing caddis off Mr Swisher, thanks again for your advice. Caught over 100 fish on your tapered leader and beaded indicator last year bloody brill. Just a note to say 'Thanks' for the extra fly enclosed with my last order. Much appreciated... and its caught for me! Thanks again for the flies. I had some great success using your flies while fishing in the Eifel (Germany) last week. I placed a new order for some additional ones, so I have enough for the coming months. P.S. Really enjoy your YouTube channel! Received the order with thanks. And thanks for the black polyphaetis. I'll try to get some of them wet this weekend. It's always your flies that come out of the box first! Hi Jon, Many thanks for the furled leader. I thought you'd like to let you know that I've had a great early season success with your Black Magic Nymph. The rivers I fish around Bath where I live are quite small so short line up-stream nymphing works best. I use a split shot about 10 inches above the nymph and that works just fine. A great fly. Well done. Hi Jon. Thanks for letting me know and look forward to receiving the goods. Nice website btw. I was searching for advice on French Leader set ups for when I go nymphing on the Usk, which is how I came across your website. Just need to get the right rod first then I'll look at ordering one or two of your tapered leaders. Thanks, looking forward to using your flies on our trout water. Really enjoying the series on YouTube, keep up the good work. Received the nymphs this morning thanks again for the freebie. Everything arrived as ordered. Thanks for the extra fly. I should be on a stream this week or so. Please call if you come to the States. I have fly fished for nearly fifty years (dry flies only) Never a nymph! Enjoyed watching you on youtube using duets! My compliments on your mastery of delivering tutorials! If you ever in N. Italy let me know will take you fishing! just wanted to give you a feed back. Yesterday, fishing in catch-release sections of the river Serio at Ponte Nossa, I used your "duo system." I was the only angler that catching fish in that section of the river. It worked for me on 12 feet 4X leader and 2 feet of 5X from the dry to nymph. Good show and many thanks. Received my flies today and i must give credit where its due, they look amazing and cant wait to hopefully hook into some nice fish over the coming weeks. Also wanted to say thank you for the extra "F" Terrestrial! Jon, flies arrived sat 5th very pleased with them and cheers for free fly. Hi Jon - I really enjoy your vids and Nelly's focussing work is getting better! I like the idea of using your Elk Hair caddis as an "unsinkable part" of the duo method. Me and some pals will be fishing some Austrian alpine rivers late April, which is our first real outing and that can be fast and furious I can't wait...but in the meantime your videos give us a taste of home (we are the Czech-British fly fishing club a group of expat business folk out here). One of my pals started actually learning to fly fish last year using your YT videos! Keep up the videos we need our fix! I have received my order of your BM Nymphs and thanx for your gift of the LJEH Caddis to enable me to try fishing the duo, pretty formidable looking character it is too. Im going order another 5 from you in order to balance up the number of nymphs that I purchased. Hello, Jon and Nellie! from Southern New Hampshire, USA! I must say a big "Thank You" to you both for producing your wonderful short films about Fly Fishing (and some about Tying). Jon, you have a wonderfully easy presentation style on camera. Your informative explanations about flies and the "Art" of Presentation to what are sometimes (Many times?) picky fish is just superb. Bravo, Jon, on that. I wish you both the very best. Hi Jon, Thank you for a first rate service and the extra fly. Just like to say you have improved my fishing no end with your U tube vids over the last three seasons. I got stuck in the rut of fishing wets , but now i fish upstream all the time my fish size has increased to the extent of trout to 2.5lb Grayling to 2lb from the river Swale. I have fished the Tees at Widdybank with my 12' Iwana Tenkara rod and like you said in your vids the ideal method . Hope to see you on the river bank some time . Love your website, so informative and your flies are just awesome. Had a great few hours Sun morning on my local river and the chub were going crazy for them as well as the brownies! Great duo fly the elk, brilliant. I bought one of your light weight French leaders a while back and had my first chance to try it today on the wonderful river Dove in Derbyshire. Inspired by your vids I was fishing in turbulent shallow water just below a weir and hooked but lost a lovely little brownie right under my feet.. Anyways a new technique for an old dog to try to master is a good thing! To buy our Onstream-guide Products please click here or if you want to leave your testimonial about our Products please go to Contact Us page. We look forward to hearing from you.